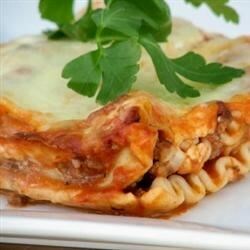 "This is a traditional baked lasagna that is a favorite in our family. Ground beef, cottage cheese, and mozzarella make it rich and filling." Preheat oven to 350 degrees F (175 degrees C). Grease a 9x13 inch glass baking pan. im sorry, this was awful!